Which trick should you teach your horse first? Easy. Just start with something that your horse does naturally. This will usually be a behavior that they enjoy or do in response to something that is going on around them. It is much easier to use a behavior your horse already does and build on it to create a trick. 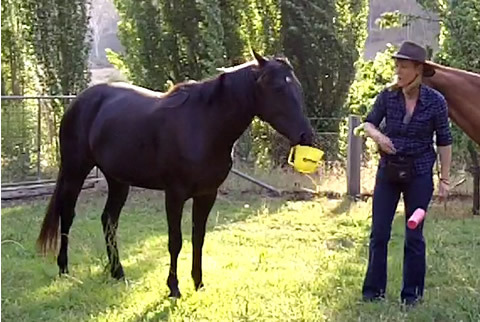 Watch your horse, particularly around feed time, to see if there is something they do that could be turned into a trick. My trainee trick horse, Bella, loves to pick things up. If I leave anything lying around she will pick it up and play with it or throw it. So she should enjoy tricks like fetching or taking a hat off my head or a handkerchief out of my pocket. Over the next few days watch your horse and notice anything they do that could be the beginning of their first trick. You might be surprised to find out how many ‘tricks’ your horse is already doing! My horse loves knocking his brushes off the fence when I’m saddling him. It’s not him being naughty, but rather curious (he’s having a sniff), which I think is a good thing as he’s 16 years old. Are there any tricks I could turn this into? I like curious horses 🙂 They are usually lots of fun and they enjoy exploring and trying new things. It sounds like he might be good at tricks where he pushes things along with his nose. For example, rolling a barrel or large ball or unrolling a piece of carpet. Hey, I got my first horse almost a year ago, and decided it would be a good idea to teach Sunny tricks as a way to bond, but I was uncertain of which specific tricks to teach him ( like ones that would encourage bad behavior- like teaching to paw/count sometimes encourages striking ). I was wondering if you could offer me any suggestions. I know he’s a good boy and learns quick, and has food manners. Thanks! There are certain tricks that I would never teach my horses – like rearing. I think it is just too dangerous (for the horse and rider). It is important to teach your horse that he never does a trick unless you ask him to. That way you could teach him to Count but know that he would only do it when you tell him it is safe to do so. Here is an article about USEFUL TRICKS. Thanks cant wait to start. I have only had my arab for a couple of months and when i first saw her she picked up my camera twice and walked off with it, lol.